* This choice will automatically be selected for Federal accounts and is not available for non-Federal users. See SAM Roles and Administrator for additional information about the administrator role and capabilities. Why are you registering this entity to do business with the U.S. government? I want to be able to bid on federal contracts or other procurement opportunities. I also want to be able to apply for grants, loans, and other financial assistance programs. I only want to apply for federal assistance opportunities like grants, loans, and other financial assistance programs. I want to conduct Intra-Governmental Transactions (IGTs) with other U.S. government organizations. I want to conduct IGTs with other U.S. government organizations, bid on federal contracts or other procurement opportunities, and apply for federal assistance opportunities like grants, loans, and other financial assistance programs. I want to conduct IGTs with other U.S. government organizations and apply for federal assistance opportunities like grants, loans, and other financial assistance programs. 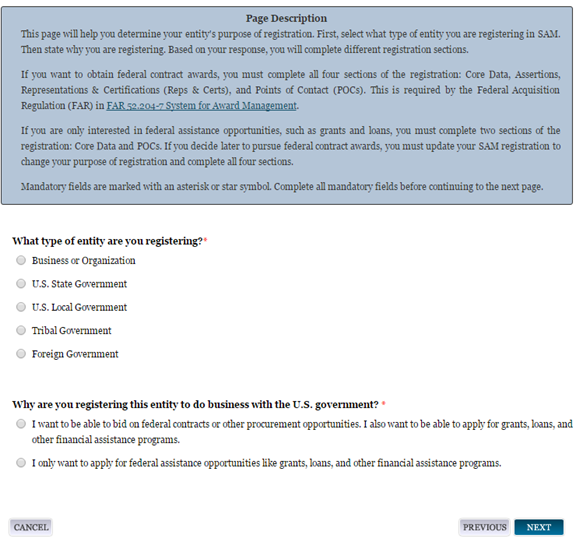 Your response to the questions displayed in the “Determine your Purpose of Registration” page determines what sections of the application are required to be completed for your registration. You only need to fill out the sections that are relevant to your purpose of registration in SAM. The data you fill out in each section will be tailored to your particular type of entity. If you are satisfied with your answers to the purpose of registration questions select “Next” to continue. You are able to save your registration at any point during the process as long as you verify and save a valid DUNS Number and/or DoDAAC, Name, and Address. If you select “Cancel” or leave a page at any time during the registration process, the information entered on that page will not be saved. Incomplete registrations (registrations that have not been submitted) will be deleted from the system after 90 days of inactivity. You will receive email notices prior to your incomplete record being deleted. On each page, all mandatory fields will be marked with an asterisk (*) or star symbol. Complete all mandatory fields on each page to continue. All mandatory data must be provided before the registration may be submitted. Definitions can be found by using the content glossary on the right of your screen. They are also available in Appendix B of this user guide.